In the midst of all the chaotic and divisive events happening in the world, such as domestic violence, incarceration, divorce and mental health issues, author Charles Lim Wu recognizes the need for people to start treating one another better. 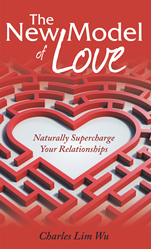 “The New Model of Love: Naturally Supercharge Your Relationships”, a thought-provoking and well-reasoned book on the state of human relationships, is his revolutionary, elegant discussion and exploration of the old model of love and a redefinition of love altogether. Wu explores the origins of the old model of love—that we experience joy when we are loved—and tells how the model of love that ensured our survival as infants and children is no longer suited for guiding us through adolescence and adulthood. He stresses that the new model of love opens up new relationship possibilities we have never before experienced. Wu proposes that joy only comes from loving someone, not from being loved. Using his personal experiences and discoveries as a backdrop, Wu examines the love impulse from biological, evolutionary and economic lenses and tackles the topic of love with great depth and cohesion. He offers an opportunity to experience abundant joy and happiness in all our relationships, with the goal of naturally and freely experiencing infinite love. “The New Model of Love” presents a life-changing paradigm shift that promises to dramatically transform the way the people of the world interact with one another, bring joy and life to otherwise poor relationships and solve many of the world’s most challenging problems. Charles Lim Wu earned bachelor’s degrees in economics and engineering and an MBA. A refugee, an engineer, a business development manager, a banker, a product manager, and an investor, he is the creator of a new movement called Modelism and is the first Lucid Modelist. Wu is a successful investor in real estate, shares, and start-ups.